Can Above Ground Pools be on Concrete? Posted on October 12, 2018 , in Above Ground Pools. Above ground pools are a great option for those that want to enjoy the cool waters of summer, without the weeks of construction, high costs, and tedious maintenance. But just because above ground pools can make things easier and less expensive, does not mean they are necessarily without rules or standards. In fact, there are some general rules on how to best take care of your above ground pool in order to make sure it lasts as long as possible. One of them asked the question, can above ground pools be on concrete? Not only can above ground pools rest on concrete, but they should! Typically these concrete slabs are leveled and provide a comforting structure that will prevent moisture from building up or mold from taking place. It is critical that the surface of a pool rests on be a flat surface. If the pool is at an incline as little as 1 inch, it can affect the integrity of the pool. 3 inches can actually begin to damage the pool over time. Even though many above ground pools are durable, they only remain that way as long as they are taken care of well. When resting at a slant, it puts unnecessary pressure on parts of the pool. If you are debating between leveling out some ground to pouring some concrete, it is actually going to be easier to pour some concrete. This is because as you pour in the concrete it is a liquid and will level out itself. 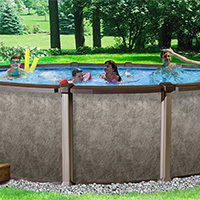 An above ground pool can affect grass, gravel, or the dirt it sits on. You may not consider it but pools can be extremely heavy, containing 30,000 gallons of water and weighing nearly 125 tons. In order for that weight to be properly supported it is suggested a 4-inch concrete slab is built to withstand the pressure. It may seem odd that you would need to protect your pool from the rain, but it is what happens underneath the pool you need to worry about. When an above ground pool rests on a surface like grass, water can seep below the pool and begin to grow mold over time. This differs to concrete where the water is more likely to dry or drain off. While it is clearly suggested that concrete slabs can be the best option for a base of your above ground pool, you should consider the hard surface your pool is resting on. Risks with a hard surface at the bottom of your pool along with the added friction your pool will encounter. To fight this it is suggested you put some foam protection underneath the pool. Foam-board insulation is one option and can provide the proper amount of protection. If you are in the process of buying an above ground pool, you will know there are many things to consider. One of them should definitely be the surface you rest your pool on. There are many options out there but if you are looking to have your above ground pool last for many years, it is best to go with the option that is going to protect the materials of your pool. A concrete slab can offer that protection and allow the pool to be structurally sound for much longer. To find out more about above ground pools, download a buyer’s guide.